This program calls for volunteers to survey the wrack line (line of seaweed) for sea turtles. 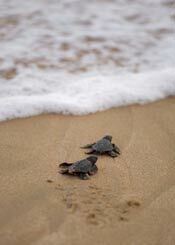 These sea turtles are called 'washbacks', and are just a bit larger than a hatchling. Once the sea turtles hatch from their nests they swim in search of a large mass of seaweed where they find refuge and protection from larger predators. They forage here for an unknown amount of time while the seaweed floats with the currents and tides. Sometimes storms and high tide events from August through November cause this mass of seaweed to be pushed onto the beach. The washbacks are extremely tired, dehydrated and need medical attention. Interested in volunteering for the Sea Turtle Washback Program? From May 1 to October 31 dedicated marine turtle patrol volunteers survey the beaches at sunrise to post off the nest of sea turtles while collecting important data on nesting activities. While conducting nesting surveys volunteers must endure physically demanding conditions that are often hot, sandy, and buggy while collecting accurate scientific data. This volunteer program is permitted through Florida Fish and Wildlife Conservation Commission (FWC) and coordinated through the efforts of a Marine Turtle Permit Holder. Available nesting survey positions are limited due to permitting restrictions and volunteers must complete extensive training provided by FWC, St. Johns County Habitat Conservation and the Marine Turtle Permit Holder responsible for specific stretches of beach. Interested in volunteering for the Sea Turtle Patrol?